Last visited by Rocko February 15, 2014. Unfortunately, this village no longer exists. 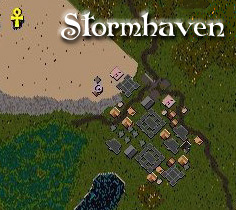 Called the Bastion of Hope and the City of Compassion by the locals, Stormhaven is one of the oldest player run cities on the Trammel Facet of the Napa Valley. The city was founded by the Baroness Elsa shortly after Nystul opened the portals to the Trammel Facet. It’s located south of the Crossroads Guard Castle at the Yew, Britain and Minoc crossroads at the corner of the great desert that surrounds the Shrine of Compassion. Stormhaven is home to a diverse range of individuals, from roleplayers to craftsmen to PvPers, and the stronghold of a number of guilds, including the Storm Ryders of Hope (S^R), the Stormhaven Alliance (S^A) and the Highwaymen of Stormhaven (=H=). There are many interesting tourist attractions to be found in Stormhaven. The large tower near the city’s southern border holds the S^R guildhouse and the Stormwatch Tavern. Up to 30 patrons can be seated at the tables and bar in the main tap room. Upstairs is the meeting hall used by the Gendarmes, Stormhaven’s elite force of knight and mage protectors. On the roof of the Stormwatch Tavern is the fighting arena, where PvP contests and tournaments take place. The Emporium holds a rune library, with runes to major cities, shrines, dungeons, and other player cities on Trammel and Felucca. (Felucca destinations require the user to bring a moonstone along. Simply hit the rune to take you to the corresponding location on Trammel, then use your moonstone to cross over to the Felucca city.) The office of Baroness Elsa, and the town stone for the Stormhaven Alliance are also located inside the Knowledge Emporium. 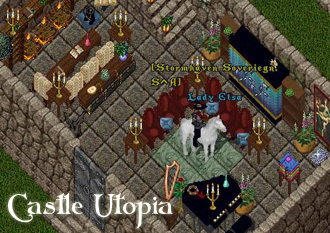 One of the best-decorated castles on Trammel, Baroness Elsa’s castle is a popular place for visitors to tour around. Parties and events are held here more often than Court, however, for the Baroness of Compassion does not often spend her days sitting upon a gilded throne. For all your shopping needs, Stormhaven has a number of mini towers between Elsa’s Castle and the Stormwatch Tavern. The Raging Hammer Smith and Bowyer shop offers GM weapons and armor for purchase. The Hatchet and Axle carries tinker and carpenter goods. 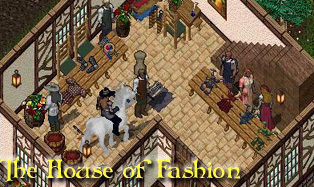 The House of Fashion, Tannery and Fine Jewelry is the place to find all your fashion needs, from dazzling diamond necklaces to dyed leather outfits. Treasure Seeker Tower offers maps, fishing treasures, and rares. The Tower of Arts sells musical goods on the top floor, art supplies such as canvas, paints, and paintings on the second floor, and also a fine collection of both player-created fiction and essays on the magical arts on the main floor. In the Tower of Knights and Mystic Potion Shoppe you will find the Event guildstone, used for PvP events, as well as potions and kegs. Across the road from the mini towers is Stormhaven’s most sought after shop – Coug and Al’s Fine Mercantile. Here, you will find house add-ons, semi-rares, potion kegs, furniture, and special hard to find treats. 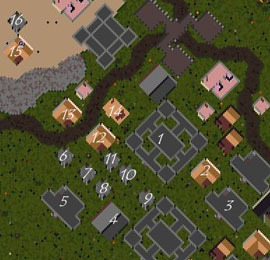 Eastwatch Tower, the large tower on the east side of Castle Utopia, boasts a vendor mall and Banquet Hall, that can accommodate even the largest of guild gatherings. For visitors seeking something more than a place to shop or have an ale, Stormhaven is also home to a vast number of roleplayers. Public events are held weekly, sometimes several nights a week; look for announcements on Stratics regarding scavenger hunts, PvP events such as the Pirate Jamboree, animal round-ups, dungeon invasions and other events.